DIE Jovis, videlicet, 4 die Augusti. and that the E. of Portland ought not to retain the Command of the Isle of Wignt. E. of Portland professes his Loyalty. His Person to be secured, but the Profits of his Government to be secured to him. Committed to the Sheriff's Care. E. of Pembrooke to secure the Isle of Wight. L. Digby's Man to be examined. Order to suppress Riots in London. and for Dispatch to the Treaty for the 1000 Scots for Ireland. Message from the H. C. with an Order for Indemnity for Dorsetshire Voluntiers. Order for 5000l. for the E. of Leicester's Extra Charges, rejected. L. Mayor &c. to attend Tomorrow. Order for Indemnity of Dorsetshire Voluntiers. Lord Kymbolton was appointed to be Speaker this Day. A Message was brought from the House of Commons, by Mr. Pym; who said, "That the Parliament having committed the Care of the Safety of the Kingdom to a Committee of both Houses, all their Labours are to prevent the Dangers of the Safety of the Kingdom. "That the said Committee have this Morning received Information, that the Governor of Portsmouth hath declared himself against the Parliament, and hath given an Oath to the Garrison in it; but those that refused it, he hath thrust them out, and he hath taken Papists into the Fort, with Provisions. "1. Because his Wife is a Recusant, and her Brother a Person voted to be a Malignant, and his Brother in the Town of Portsmouth. The Desire of the House of Commons is, That the Person of the Earl of Portland may be secured; and that the Isle of Wight may be put into the Command and Custody of the [ (fn. 1) Earl of Pembrooke], according to the Ordinance of both Houses of Parliament." The Earl of Portland, being present, professed his Loyalty to the King, and Faithfulness to the Parliament; and then he withdrew. The (fn. 2) House taking this into Consideration; and, after Debate, the House Resolved, That the Earl of Portland (fn. 3) be presently, for the Security of his Person, confined to Sheriff Garret, of London; not to be thought as an Imprisonment for Delinquency, but for a temporary Security, until the Earl of Pembrooke hath secured the Isle of Wight, for the Safety of the Kingdom; and that the Profits of the Place shall not be meddled withall, but to be reserved to the Earl of Portland. The Earl of Portland was called in, and acquainted (fn. 4) with the Resolution of the House aforesaid, to which his Lordship submitted, and desired to go to his House, for to fetch some Papers; and that his Lady and Family may stay there. His Lordship withdrew again. Ordered, That the Gentleman Usher attending this House shall convey the Earl of Portland to Sheriff Garrett, who is to keep him in safe Custody until the Pleasure of this House be further known, but not as a Delinquent. Concerning the Earl of Portland's Desire, "That his Lady and his Family may remain in the Isle of Wight;" it is referred to the Committee for the Safety, to give to the Earl of Pembrooke Instructions for the disposing and providing for the Security of his Lady and Family; and concerning the fetching of his Papers at his House in London, this House agreed, That he shall have Liberty to go, with the Gentleman Usher, to peruse his Papers. Ordered, That the Earl of Pembrooke do presently take Care for the securing of the Isle of Wight, for the Security of the Kingdom; and referred to the Committee for the Safety of the Kingdom to draw up Instructions for his Lordship. Ordered, That the Lord Brooke and the Lord Robartes do take the Examination of the Lord Digbie's Man, sent up from the Earl of Warwick; and to report the same to this House. Upon Complaint made to this House, by the Sheriffs of London, of a great Riot committed last Night in London; and that the Doors of The Compter in Woodstreet were broken open, and the Sheriffs Houses threatened to be pulled down: It is Ordered, That Serjeant Major Skipon shall be assistant to the Sheriffs of London, to suppress all Riots and Tumults. 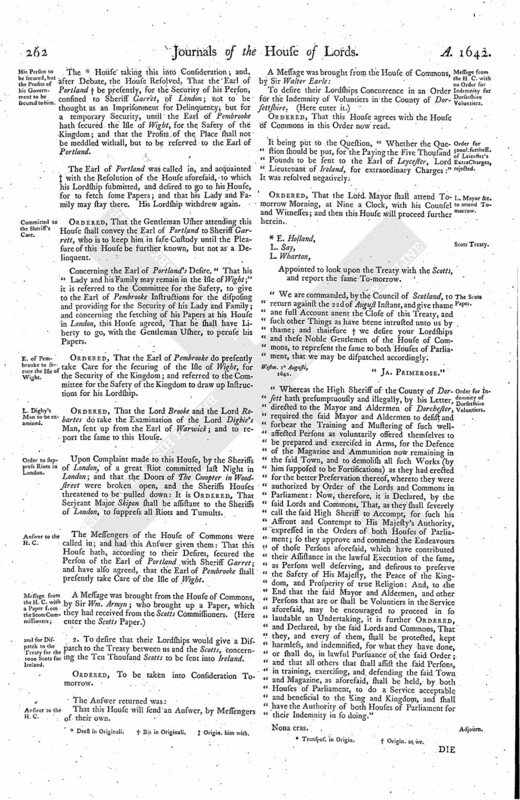 The Messengers of the House of Commons were called in; and had this Answer given them: That this House hath, according to their Desires, secured the Person of the Earl of Portland with Sheriff Garret; and have also agreed, that the Earl of Pembrooke shall presently take Care of the Isle of Wight. 2. To desire that their Lordships would give a Dispatch to the Treaty between us and the Scotts, concerning the Ten Thousand Scotts to be sent into Ireland. Ordered, To be taken into Consideration Tomorrow. That this House will send an Answer, by Messengers of their own. Ordered, That this House agrees with the House of Commons in this Order now read. 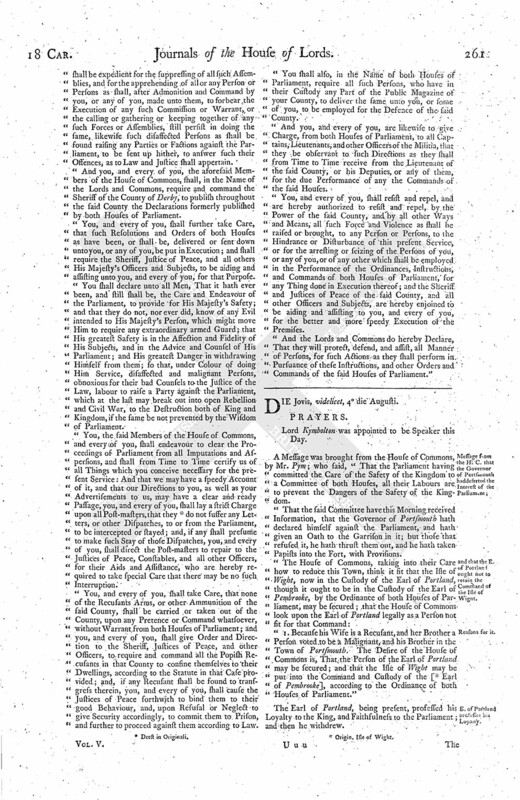 It being put to the Question, "Whether the Question should be put, for the Paying the Five Thousand Pounds to be sent to the Earl of Leycester, Lord Lieutenant of Ireland, for extraordinary Charges:"
Ordered, That the Lord Mayor shall attend Tomorrow Morning, at Nine a Clock, with his Counsel and Witnesses; and then this House will proceed further herein. Appointed to look upon the Treaty with the Scotts, and report the same To-morrow. "We are commanded, by the Council of Scotland, to return against the 22d of August Instant, and give thame ane full Account anent the Close of this Treaty, and such other Things as have beene intrusted unto us by thame; and thairfore (fn. 6) we desire your Lordships and these Noble Gentlemen of the House of Commons, to represent the same to both Houses of Parliament, that we may be dispatched accordingly. "Whereas the High Sheriff of the County of Dorsett hath presumptuously and illegally, by his Letter, directed to the Mayor and Aldermen of Dorchester, required the said Mayor and Aldermen to desist and forbear the Training and Mustering of such wellaffected Persons as voluntarily offered themselves to be prepared and exercised in Arms, for the Defence of the Magazine and Ammunition now remaining in the said Town, and to demolish all such Works (by him supposed to be Fortifications) as they had erected for the better Preservation thereof, whereto they were authorized by Order of the Lords and Commons in Parliament: Now, therefore, it is Declared, by the said Lords and Commons, That, as they shall severely call the said High Sheriff to Accompt, for such his Affront and Contempt to His Majesty's Authority, expressed in the Orders of both Houses of Parliament; so they approve and commend the Endeavours of those Persons aforesaid, which have contributed their Assistance in the lawful Execution of the same, as Persons well deserving, and desirous to preserve the Safety of His Majesty, the Peace of the Kingdom, and Prosperity of true Religion: And, to the End that the said Mayor and Aldermen, and other Persons that are or shall be Voluntiers in the Service aforesaid, may be encouraged to proceed in so laudable an Undertaking, it is further Ordered, and Declared, by the said Lords and Commons, That they, and every of them, shall be protected, kept harmless, and indemnified, for what they have done, or shall do, in lawful Pursuance of the said Order; and that all others that shall assist the said Persons, in training, exercising, and defending the said Town and Magazine, as aforesaid, shall be held, by both Houses of Parliament, to do a Service acceptable and beneficial to the King and Kingdom, and shall have the Authority of both Houses of Parliament for their Indemnity in so doing." 1. Origin. Isle of Wight. 2. * Deest in Originali.